A team of hackers has allegedly broken Microsoft's security and got its hands on Halo: Reach a month early. 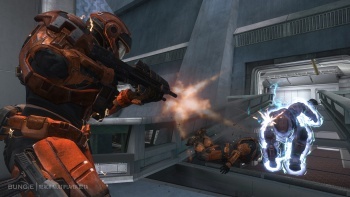 Remember that twelve-hundred dollar Halo: Reach listing we told you about earlier in the week? Well, it looks like it's gotten some attention, and not just for its hefty price tag. A group of modders from the Game-Tut forums have claimed that they were able to trick Microsoft's servers into letting them download the game and have been taking it for a spin. The group said that obtaining the game had been a challenge, but even though they'd been successful, they had no plans to distribute it. Bungie is yet to comment on these reported leaks, although its forum moderators have reminded posters that discussing leaked details was a surefire way of earning a permanent ban. Microsoft, on the other hand, has issued a statement about the leaks, saying it was aware of the group's claims and was "aggressively investigating" the matter. If Reach has indeed been leaked - and there is other evidence besides the team's comments to suggest that it has - then it will come as something of a blow to Microsoft. It's not going to stop the game selling a bajillion copies, but it may make Microsoft reconsider using Xbox Live for sensitive material in the future. Halo: Reach gets its official release on September 14th.